The superstar kicked off her Barbra: Live tour in style on Monday night. 11:57PM EST October 8. 2012 - PHILADELPHA -- Barbra Streisand warmed up for her highly anticipated homecoming with a tour-opening concert Monday at Wells Fargo Center before a sold-out crowd of 12,000. The Barbra: Live tour continues Thursday and Saturday at the new Barclays Center in her native Brooklyn. The start: Streisand, 70, strolled out to wild applause, then opened with Being Good (Isn't Good Enough). The way she wore: The singer was dressed in an elegant floor-length skirt topped with a black sequined vest and jacket and a sparkly necklace. Philly nods: After noting similarities between Brooklyn and South Philly ("You have cheesesteaks, we have cheese blintzes"), she paid tribute to Alan and Marilyn Bergman, the Philadelphia composers behind her medley of Nice 'n' Easy and That Face. Guest night:The Italian pop-opera ensemble Il Volo joined her for Smile, then did two songs by themselves, including a rousing O Sole Mio. "Take that, Justin Bieber!" she joked, referencing the teen trio's tender age. Movie night: After an aching The Way He Makes Me Feel (from Yentl), she answered audience questions, turning political on a query about Big Bird. '"I hope nobody shows Mitt Romney how to get to Sesame Street -- or Pennsylvania Avenue." Hits parade: She dipped into her hits with a stern No More Tears (Enough Is Enough) and said she wrote herself a note the night before Marvin Hamlisch died to tell him she would be performing his orchestration for The Way We Were. "I can't seem to throw that note away," she said before singing a rich rendition. Second act: A "Brooklyn version" of Cole Porter's You're the Top switched up the words to reflect her hometown borough, including nods to Sandy Koufax and Judge Judy. Botti break: Streisand let herself be serenaded by trumpeter Chris Botti on What'll I Do. My Funny Valentine was a fine example of two pros finishing each other's phrases. Reborn: Her 1976 film A Star Is Born was represented by Lost Inside of You, with Botti adding a bluesy framework. She couldn't resist, however, and launched into Evergreen, with Botti nicely cutting the saccharine. Her new duet partner: Son Jason Gould ("His first public appearance," Mom says) displayed a soft, pleasing tenor voice as both sat down to sing How Deep Is the Ocean. A golden moment: She sang a beautifully burnished version of People, then an autumnal Here's to Life. It was a touching, masterful rendition from an aging pro, and she toasted the audience with a cup of tea, ending with "l'chiam" (to life). The night ended with an encore of Leonard Bernstein's Some Other Time. Barbra Streisand’s first concert in six years Monday night at the sold-out Wells Fargo Center felt more like a soft opening than the start of a highly anticipated jaunt. Even the title of the tour, "Back To Brooklyn," gives it away. Streisand will make her debut in the borough where she was born Thursday night at the much ballyhooed Barclays Center. Her consistently entertaining three-hour concert commenced with a montage of photos featuring shots of the iconic figure’s childhood in Brooklyn. There was also footage from a 1970s documentary with interviews featuring Streisand’s high school friends. It closed with a pal asking Babs to come back to Brooklyn for a concert. Well, that’s finally happening, but before Streisand returns to Brooklyn, she warmed up for two weeks with rehearsals at Temple University’s Liacouras Center and she rendered a wonderful concert in South Philadelphia. Her voice isn’t what it once was, but what do you expect at her age? However, the mezzo soprano can still hit the high notes, which she did during her moving rendition of a re-arranged "The Way We Were" and the pretty "Don't Rain On My Parade." Exquisite choices "The Way He Makes Me Feel," from the "Yentl" soundtrack, "No More Tears (Enough Is Enough)" and the show opener "Being Good (Isn’t Good Enough)," a terrific 60-piece orchestra and her special set of pipes were just part of the reason the show will go down as a truly memorable event. 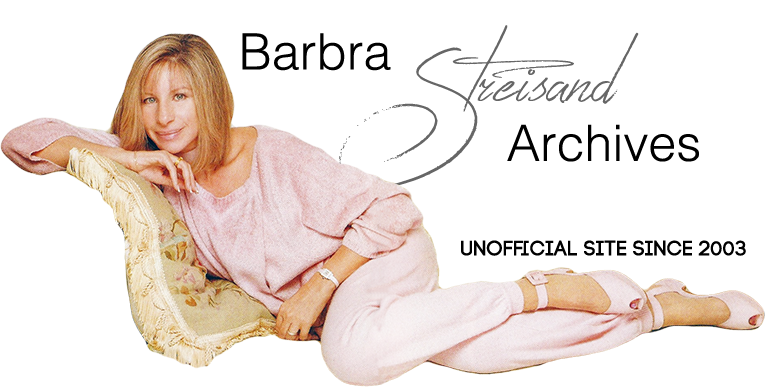 Perhaps what was most significant is that Streisand impressed by just being herself. She held court in between each song and lived in the moment. The legendary figure responded to virtually every remark by the audience and somehow made the arena seem like a club. She paid tribute to her good friend, composer Marvin Hamlisch, who she started working with a half-century ago. She gave thanks to Philadelphia composers Alan and Marilyn Bergman with a medley of "Nice n’ Easy" and "That Face." But the songs paled compared to her anecdotes about the talented couple. During a question-and-answer session, Streisand brought down the house when she responded to a question about Mitt Romney’s threat to hunt down Big Bird. "I hope nobody shows Mitt Romney how to get to 'Sesame Street' or Pennsylvania Avenue." The crowd erupted as the confirmed Democrat jumped on her political high horse. She sung with the gifted young Italian tenors Il Volo for "Smile." "Take that Justin Bieber,” Streisand cracked after the trio of engaging teenagers impressed. And then there was the sweet duet with her 45-year-old son Jason Gould. It was his first public performance, according to Mom. Before Gould capably rendered "How Deep is the Ocean" with his mother, Streisand whispered into the microphone "that the words are there," which was a reference to the teleprompter on the side of the stage. It was cute watching her be so maternal with her middle-aged son. Gould or Streisand didn’t need any help as they nailed the tune. Streisand, who was elegant in a variety of gowns, particularly a flowing black number, explained that she gave up touring after flubbing a few of her songs during a concert in Central Park in 1967 before returning to the concert trail in 1984. Is Streisand, who picked up the baton from Frank Sinatra as America’s most iconic entertainer, on her final tour? She says she’ll never say never. If this was her last Philadelphia show, she went out on a high note. "I should open all my farewell tours in Philadelphia!" "You're texting live from the first row?" "The Way We Were/Through The Eyes Of Love" — deeply authentic & emotional - the original film arrangement was a perfect salute. Jason's "Nature Boy" with photo tribute for Barbra's birthday.... quite loving. "There was boy.... a very strange, enchanted boy....."
The amazing vocal power of "Rose's Turn/Some People" proves that she will be a FEROCIOUS Mama Rose. "Here's To Life" - "Some Other Time" - "My Funny Valentine" - "Bewitched, Bothered and Bewildered" and "People" -- demonstrates her skill in phrasing and flawless in-the-moment interpretation. Each of these ballads felt as if they were being sung with a new, fresh approach. And to conclude, the more often she performs live, she seems to relax with the audiences energy & adulation -- very comforting. I loved being in my hometown with Barbra Live. Unforgettable. Here's my report on the Philadelphia opening night concert of Barbra's Back to Brooklyn show. Nobody sings like Barbra and she is in incredibly good form, sounding crazy-good. She looks amazing, too ... A couple of the gowns she wears are stunning. I experienced her as very present and in-the-moment on stage. Between singing her songs, she can hear the audience call-outs and notice what's going on in the audience and what's happening on stage. I was moved to tears by some of her songs; on others, I got goose bumps when she hit a certain note or discovered a new way to sing a phrase. She is truly the best, and it's such a pleasure to see her perform live. When you enter the arena and see the Brooklyn Bridge projected onto a big curtain that obscures the stage while Johnny Mathis songs from the 1950s play ... you know you're in store for something special. Show time came and we were warned by an announcer that “the lights will dim abrubtly” — and they did! Projected onto the big screen was a video of “You'll Never Know” sung by little-girl-Barbra, accompanied by many previously-unseen photographs of Barbra growing up in Brooklyn. As adult-Barbra took over singing the song, still more amazing shots of Barbra made the audience verklempt—and we still hadn't seen or heard the live Barbra! The song built to a crescendo, the audience applauding, excited. The orchestra began playing the “Nicky Arnstein” notes from the Funny Girl overture. The curtain released and Bill Ross and the orchestra were revealed as they played the Funny Girl overture. Some very rare photographs (and telegrams!) from the 1964 Funny Girl show accompanied them on the two video screens. Barbra made her entrance—orchestra center—on a set that was very similar to the 2006 show. And she sang “Being Good Isn't Good Enough,” sounding rich and strong. Barbra wore a black sequined jacket over a white, open shirt and a long sequined skit with a peek-a-boo slit, showing some leg through the black lace. (Gowns designed by Donna Karan). After the opening number, Barbra talked about Brooklyn — how she left Brooklyn to pursue her dreams, but Brooklyn never quite left her. Then, to the tune of “As If We Never Said Goodbye”, Barbra sang some Brooklyn-tailored lyrics. And I need a moment ... so talk amongst yourselves, I'm feeling verklempt! Il Volo, singing an a cappella version of the Duck Sauce hit, “Barbra Streisand” joined Barbra on stage. Together, they all sang “Smile.” Barbra left the stage and Il Volo sang two Italian songs. Like Barbra said, her Italian tenors are getting younger! I enjoyed them, and they really seem to be having a good time up there. “Take that, Justin Bieber!” Barbra said, as she took the stage wearing a gorgeous, grey draped Donna Karan gown. The concert's next segment was about composers Streisand loved. Then, a medley of “Rose's Turn/Some People/ Don't Rain On My Parade” and the end of Act One. Before Act Two began, the audience was entertained when the Duck Sauce video of the dance hit “Barbra Streisand” was played on the big screen. Act Two opened with a shortened version of Kevin Burn's documentary I Remember Barbra, with Brooklyn residents talking about their idol, Streisand. Bill Ross played a short musical piece, and Barbra was back wearing a simply stunning coral-colored Donna Karan gown and singing more Brooklyn-tailored lyrics to Cole Porter's “You're the Top”. Gotta say that the Chris Botti section is a real favorite of mine. I honestly did not know his work before this concert. Barbra and Chris's duets are just great ... musical magic on stage, for sure. Don't miss his “Emmanuel,” a trumpet/violin duet. It's an artistic high in the show. When Barbra returns (wearing a black gown, edged in gold), she plays a video that her son, Jason Gould, made for her. Lots of rare photos of Barbra and baby Jason. Introduced by his proud mother, Jason Gould is “played on” with The Prince of Tides theme music. There's some cute patter between them as they sit opposite each other on stools. “We used to sing songs from Funny Girl and Hello Dolly,” Barbra told us. “Did we sing anything you weren't in?” Jason kidded. Then he sang (the audience listened quietly) ... and she kvelled ... and then they sang together. Just amazing. Standing ovation. Jason inherited his mom's chops, sounded amazing, and proceeded with his solo of “This Masquerade” as Barbra watched, lovingly, from the steps of the stage. “People” was the original 1964 arrangement (with the piano solo). I love that Barbra went for a wistful ending instead of the big Broadway finish she's used in past concerts. I got a few tears in my eyes when Barbra serenaded us with “Here's To Life.” So wise and passionate! For “Make Our Garden Grow,” Barbra introduced it with a proverb about old men planting trees that they will never sit under. She explained that we are caretakers of the Earth and, joined by the chorus, Botti, the Il Volo guys, they really brought down the house. Afterwards, a snippet of “Somewhere” was aided by the chorus, and Barbra hit those stunning notes at the end. Barbra and her team have put together a solid show. Really entertaining. While they borrowed some of the things that worked so well in 2006, they also notched up the musicianship and artistry. Everyone on the stage is just SO GOOD. While the show is not 100% Streisand, I definitely enjoyed the guest stars and, as a whole, had a very satisfying concert experience. I am simply grateful to be able to enjoy a performer I think is amazing who is still working at the top of her game. Barbra, to me, is truly the greatest star. With this show, Barbra continues to stun me with her beautiful gifts. You’re the silk and satin. You’re the top! You can keep Manhattan. You’re a Maharaja, a Brooklyn Dodger, you’re family. You’re the art in an old museum. You’re the taste of cold egg cream. You’re a Brooklyn Net on a private jet, non-stop! Come on baby, there’s no maybe, you’re the top! You’re a Rolls Royce dealer, a wonder wheeler, you’re Gypsy Rose! Take a ride on the IRT line. It’s a view that is really divine. It’s so perfect you don’t need to Photoshop. Hey, there baby, there’s no maybe, you’re the top! You’re the shine on Liz Taylor’s ring. You’re the crown on my Loew’s Kings. You’re a Brooklyn Height and an all-night coffee shop. Listen, baby, there’s no maybe, you’re the top! You’re the top, you’re a Botticelli. You’re the top, you are a kosher deli. You’re the sav’ry taste of a plate of matzah brei. You’re a lean salami, a hot pastrami, you’re pizza pie! And you know it’s true, it’s an accent you can’t drop.